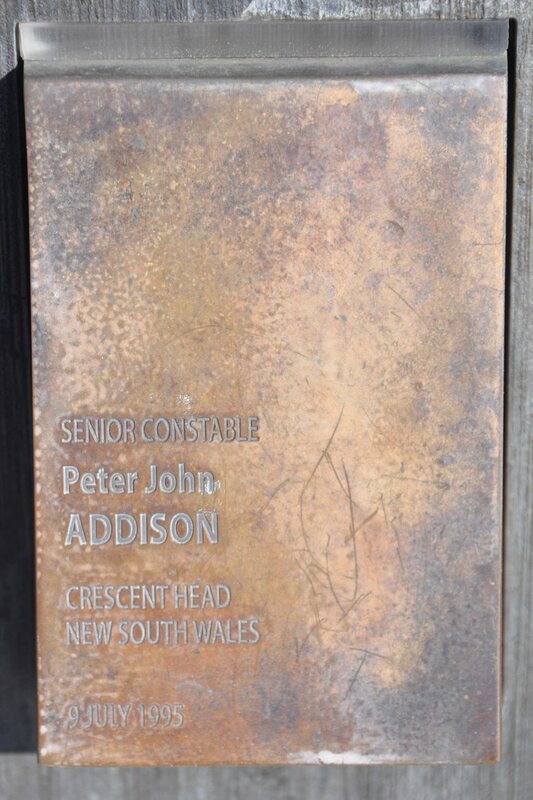 Peter John ADDISON – touch plate at National Police Wall of Remembrance, Canberra. 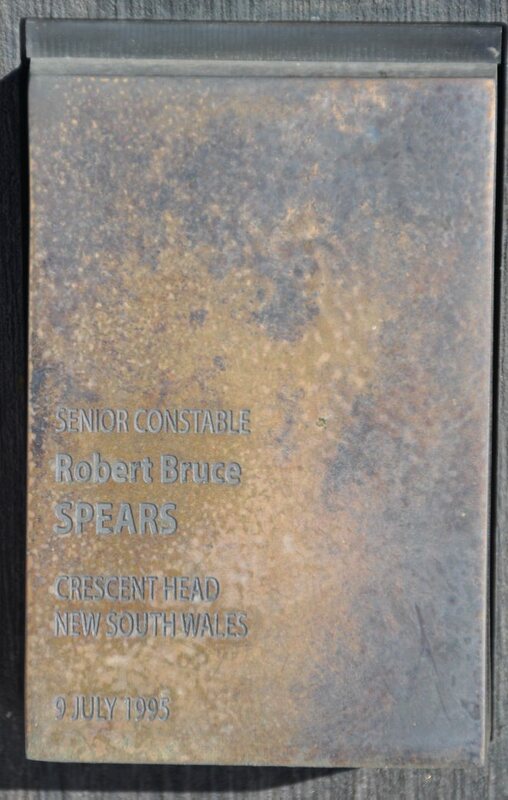 Touch plate for Senior Constable Robert SPEARS at the National Police Wall of Remembrance, Canberra. 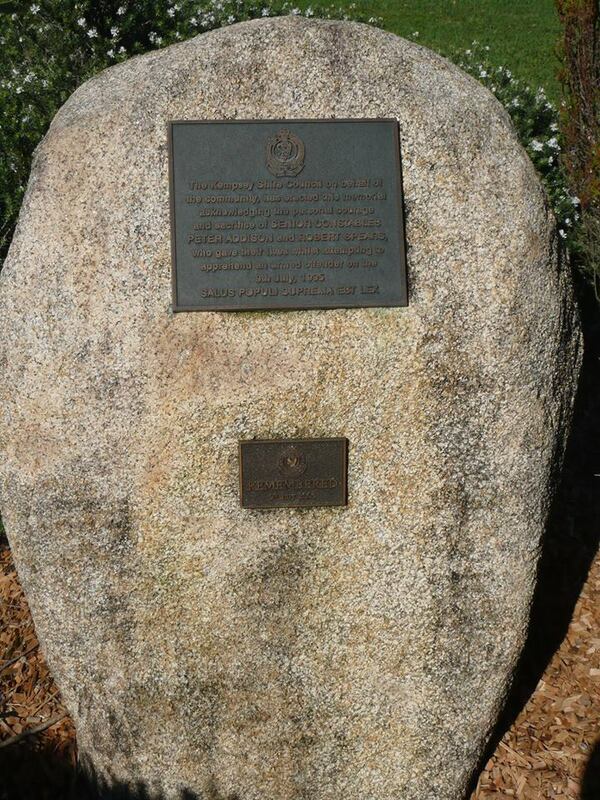 Crescent Head memorial as of July 5, 2013. The memorial to Senior Constables Peter Addison and Robert Spears is being well cared for. 2013 marks the 18th anniversary of their death. Such a sad waste of the lives of such good men. Their bravery was exceptional. R.I.P. 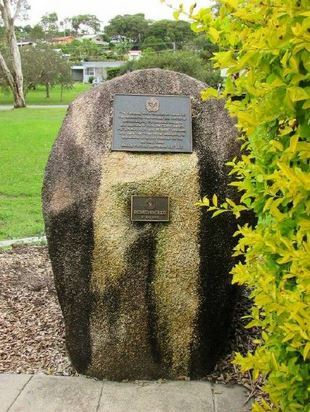 About 12.35am on 9 July, 1995 the constables were performing night shift at the Kempsey Police Station when they were called to a malicious damage complaint at the nearby township of Crescent Head. Having attended one address in relation to the complaint they drove to a dwelling in Main Street, Crescent Head. There they parked the police vehicle in a driveway and began to walk toward the front door. At 1.22am an urgent radio message was received from Senior Constable Addison requesting urgent assistance. It was later learned that the offender McGowan had hidden near the carport of the dwelling and, camouflaged and armed with a high-powered Ruger rifle, had opened fire on the two police. While withdrawing to the police vehicle Senior Constable Spears received a severe wound to the head and collapsed onto the ground. After exchanging shots with the offender Senior Constable Addison quickly sought help from neighbours. While apparently seeking a house with a telephone so he could call for assistance for his partner, he was also shot to death. The murderer then committed suicide with the rifle. At the inquest into the deaths of the two constables the New South Wales Coroner Mr Derek Hand commended both men for their extraordinary courage. Special mention was made of Senior Constable Addison‘s bravery in that “No-one would have blamed him if he had decided to seek safety. Not only was he obviously concerned about Constable Spears but he was faced with an armed man who could have caused much more death and injury in the neighbourhood”. Mr Hand also commended the brave actions of Detective Senior Constable Michael Clark, Ambulance Officer Edward Hill and Mr Gregory Barnett. Senior Constable Addison was born in 1959 and joined the New South Wales Police Force on 6 November, 1981. At the time of his death he was stationed at Kempsey. He was posthumously awarded the Commissioner’s Medal for Valour. Senior Constable Spears was born in 1959 and joined the New South Wales Police Force on 26 June, 1987. At the time of his death he was stationed at Kempsey. He was posthumously awarded the Commissioner’s Medal for Valour. Feb. 6, 2001, 9:02 p.m.
ONE of two police officers killed after being ambushed by a drunken gunmen at Crescent Head in 1995 may have survived if he had been issued with an $18 speedloader the Industrial Relations Court has been told. NSW WorkCover Authority is proceeding with eight summonses against the Crown over alleged Occupational, Health and Safety Act breaches by the NSW Police Service stemming from the shooting deaths of Kempsey policemen, Senior Constables Robert Spears and Peter Addison. The matter, being heard by Justice Hungerford, began in Sydney on Monday and is expected to take three weeks to complete. 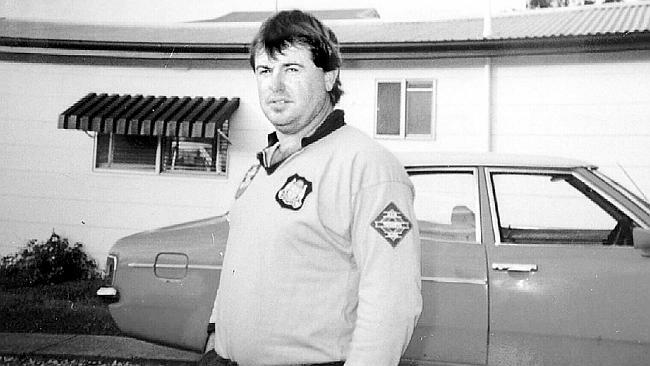 Senior Constables Addison and Spears, both Port Macquarie residents, were shot by John McGowan on July 9, 1995 when they went to investigate a domestic violence complaint. In the preceding Coronial Inquest, Coroner Derrick Hand found the two officers had been ‘massively outgunned’, lacked bulletproof vests and were hampered by poor radio communications. WorkCover alleges the breaches of the Act contributed to the deaths of the policemen and specifically refers to inadequate equipment and training and the alleged failure to provide self-loading firearms. When the officers arrived at the home of McGowan he was armed .223 calibre Ruger Rifle. Constable Spears was shot dead in McGowan’s first salvo before Const. Addison managed to enter a house across the road to use a phone for help, when he was told there was not one he left the house only to be shot dead himself. WorkCover alleges the Crown failed to ensure the health and safety of Const. Addison and Spears by not providing them with a speedloader or a self-loader weapon such as a the 9mm Glock pistol, which holds 17 rounds, now used by the service. WorkCover’s Barrister Steven Crawshaw told the court a speedloader, a round device used to load all six bullets into the then standard police weapon, a .38 Smith and Wesson, would have let Const. Addison reload more efficiently under pressure. Police Service Barrister, Peter Hastings, QC, told the court Const. Addison did not appear to be reloading at the time he was killed so the issue was irrelevant. The officers were issued with speed strip reloaders that enable rounds to be loaded two at a time. The court heard Const. Addison had fired all six rounds from his revolver and investigators found his unused speed strip lying near his body. WorkCover has also alleged that the police service failed to provide the two officers with training addressing in a practical way the tactics to be employed in a high-risk situation such as they were faced with and the systems the police service had in place to ensure training was deficient. May 3, 2001, 9:06 p.m.
SIX years after the shooting deaths of two Kempsey police officers a NSW court has found the NSW Police Service negligent in not providing adequate training and communications for the officers. 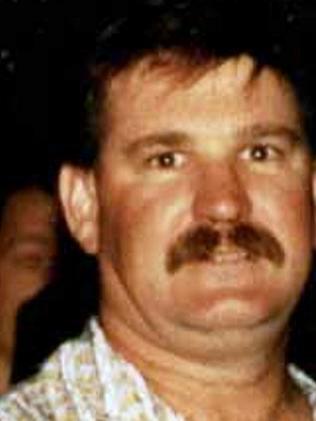 Senior Constables Robert Spears and Peter Addison, both Port Macquarie residents, were gunned down by a drunken John McGowan when they went to investigate a domestic violence complaint at Crescent Head on July 9, 1995. NSW WorkCover, in January, started proceedings against the NSW Police Service through the NSW Industrial Relations Court over breaches of the Occupational, Health and Safety Act in relation to the deaths of Constables Addison and Spears. On Wednesday, Justice Barrie Hungerford found that the NSW Police Service failed to provide adequate training and radio equipment. Justice Hungerford found that the radio communications equipment was inadequate. In the judgement Justice Hungerford said Senior Constable Spears and Addison were placed at risk of injury in that they could not communicate with other officers and vice versa. “This created a working environment in which there was a greater risk of physical harm,” he said. Justice Hungerford said there was evidence that supported the proposition that the officers concerned had not received up-to-date training in the various matters relevant to operational situations. “Those subject matters, specifically, were weapons handling, tactics in high-risk situations, method of approach to buildings, concealment and the use of lights and torches. “The very nature of the circumstances as they existed at Crescent Head during the subject incident made relevant the type of training the two officers had not recently received,” Justice Hungerford said. Justice Hungerford dismissed eight other charges brought against the NSW Police Service by WorkCover relating to firearms, firearm equipment and training and operational duties. The case was adjourned for a number of weeks to give the Police Service time to prepare mitigating evidence to be presented to Justice Hungerford before he announces the penalty. On that night in 1995, after talking to a woman complaining of domestic violence threats, Constables Spears and Addison attended McGowan’s house in Walker Street at Crescent Head. It is believed an altercation occurred between McGowan and the two officers. At some point McGowan produced a modified Ruger 14 rifle and the two officers retreated behind their 4WD. McGowan then fired a number of shots at the officers while they sheltered behind their vehicle. Both officers returned fire from their position. A short time later Constables Addison and Spears got into the 4WD. While Constable Addison radioed that they were in trouble McGowan shot Constable Spears in the head. Constable Addison then again radioed that an officer was down before retreating across the road and entering a house in a bid to use a telephone to call for help. After realising the house didn’t have a telephone Constable Addison left the house and exchanged shots with McGowan who was still beside the police vehicle. A witness stated that then Constable Addison might have emptied his revolver while retreating to the rear of the house he just exited. For reasons which were not clear, it is believed that Constable Addison attempted to go forward, with an empty gun and his torch shinning, but was shot dead by McGowan . McGowan then shot himself and was found the next morning slumped on the lawn. Jan. 10, 2002, 9:01 p.m. 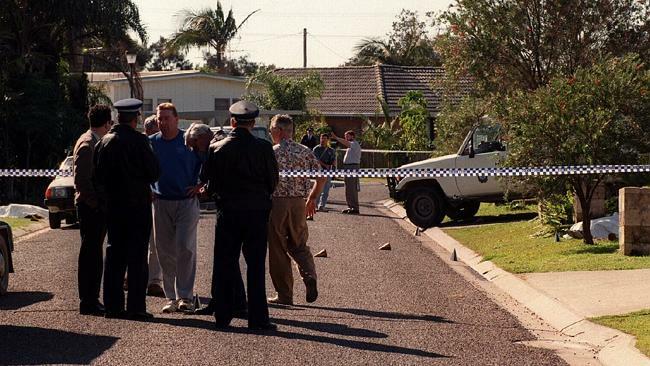 THE NSW Police Service has been fined $220,000 for not providing adequate training to two Kempsey police officers killed in a shootout at Crescent Head in 1995. 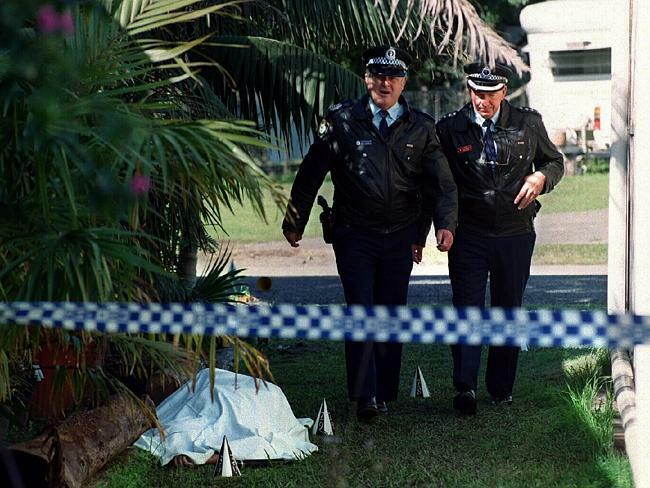 Senior Constable Peter Addison and Senior Constable Robert Spears, both residents of Port Macquarie, were shot and killed by John McGowan when they went to investigate a domestic violence complaint in the seaside village on the night of Saturday, July 9, 1995. NSW WorkCover started proceedings, in the NSW Industrial Court, against the NSW Police Service in January 2001. NSW WorkCover alleged a number of breaches of the Occupational, Health and Safety Act in relation to the deaths of Constables Addison and Spears. In May of last year Justice Barrie Hungerford found that NSW Police had not provided Constables Spears and Addison with up-to-date training in high-risk situation tactics. Justice Hungerford described the offence as being ‘extremely serious’ and noted that the officers had not undergone mandatory training in the use and reloading of weapons, use of torches, defensive tactics and communications. In assessing the penalty, Justice Hungerford said the action taken by the Police Service since that fatal day to develop training programs and its previously clear occupational health and safety record. “It is not unreasonable to conclude, in light of the clearly dangerous nature of the industry in which the Police Service operates, that the fact it has a clear occupational health and safety record is a weighty factor in its favour…,” Justice Hungerford said in his decision. “Another relevant subjective consideration is the action taken by the defendant in respect of the Police Service in developing training programs for police officers, including the important program of ammunition training, and its leading role in that respect compared with police forces in other states,” he said. WorkCover NSW acting general manager Michelle Patterson said “this tragic incident highlights the need for all employers to undertake appropriate risk management and to provide adequate training so that employees are able to carry out their duties”. Dec. 11, 2007, 8:54 p.m.
Honouring their grandfathers: Blake Addison, Joey Addison and Liam Jones. THE memories of former police officers Bob Spears and Peter Addison are being preserved by three Port Macquarie boys who never met their grandfathers. 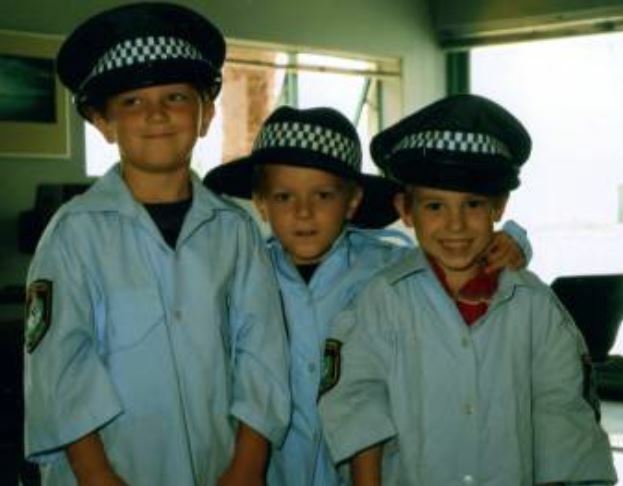 Blake Addison, 6, Joey Addison, 4, and Liam Jones, 4, were not born when the Kempsey-based senior constables were shot down at Crescent Head in 1995. Late last month the boys were taken into their grandparents’ former world of crime and justice during an open day at Port Macquarie Police Station. They joined retired officers and their families on a tour of the station to uphold their family’s connection with the NSW Police Force.“I wasn’t lucky enough to meet them but my brother Joe and cousin Liam and I were treated so special at the open day we know our pops were important and special,” Blake said. There has been a concerted effort by the Addison and Spears families to ensure the boys understand the sacrifices their grandfathers made to protect the community before their death. 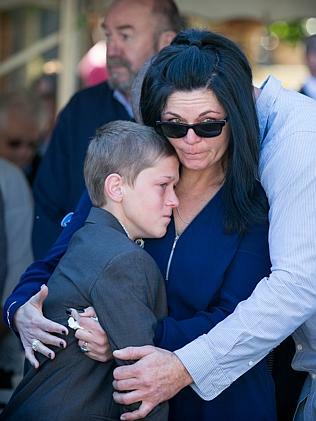 Policing had been such a dominant part of the Addison and Spears lives before the shooting that the boys’ parents wanted it to be part of the next generation too. Blake and Joey Addison were an indirect result of the tragedy 12 years ago. The shooting brought their parents Jade Spears and Glen Addison together – Jade Spears and Glen Addison were the children of Bob Spears and Peter Addison. Liam Jones is Bob Spears’s grandson – Liam’s mother Hayley Jones changed her maiden name from Addison when she married. The web of family connections and history has only brought the Addisons and Spears closer. The trio of boys, their sisters, their parents, and their grandmothers are almost inseparable. Next year, they will all attend Police Remembrance Day for the first time as a whole family to reflect again on the lives Bob Spears and Peter Addison. July 8, 2015, 4 a.m.
SACRIFICE and sadness will hang heavy in the air on Thursday for officers and wider family of the Mid North Coast Local Area Command.It will be the 20th anniversary of senior constables Pete Addison and Bob Spears‘ murders at Crescent Head.The two officers, stationed at Kempsey but both of whom lived in Port Macquarie, were killed while responding to a violent disturbance on Main Street about 1am on July 9, 1995.Electrician John McGowan killed Sen Const Spears first by using a .223 calibre Rutger Rifle, before taking the other officer’s life.McGowan then shot himself.The two officers were posthumously awarded the NSW Police Force’s highest honour, the Commissioner’s Valour Award, the following month.More than 200 officers and guests are expected at Crescent Head’s Killuke St memorial tomorrow at 10.30am to commemorate the fallen colleagues. “It will be an opportunity for all colleagues to show we haven’t forgotten what happened,” Superintendent Paul Fehon said on Monday. “It’s for us to remember, and for us to let the families know we will never forget their bravery. Police chaplain Father Paul Gooley will lead the service, which will be co-celebrated by Fr John Casey who was the LAC’s chaplain 20 years ago and conducted Sen. Const. Addison’s funeral. Police Commissioner Andrew Scipione will then present the National Police Service medals to the widows of the two officers to mark the men’s heroism and diligence to duty. Deputy commissioners Catherine Burn and Nick Kaldas will also be at the service, as well as former commissioners, politicians and the heads of Ambulance NSW and Fire and Rescue NSW. Former State Coroner Derrick Hand, who investigated the murders, is another notable guest. The general public is also invited to attend, with plenty of space available in surrounding parkland. The slain officers’ families will lay wreaths, followed by Commissioner Scipione and fellow police. The community are also able to lay a wreath. A reception will take place following the ceremony at the Crescent Head Country Club. TWO families united in the most horrific of circumstances are forever joined through the generations. 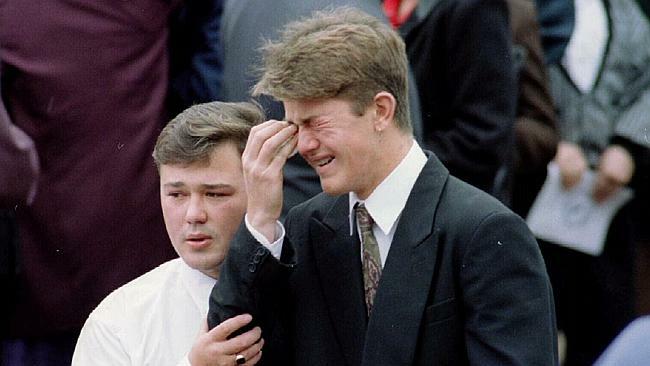 Senior Constables Peter Addison and Robert Spears, both 36, were killed by a gunman after responding to a domestic violence call in Crescent Head on the Mid North Coast on July 9, 1995. Their children Glenn Addison and Jade Spears, who were 16 and 15 at the time, met after their fathers’ deaths and went on to get married. 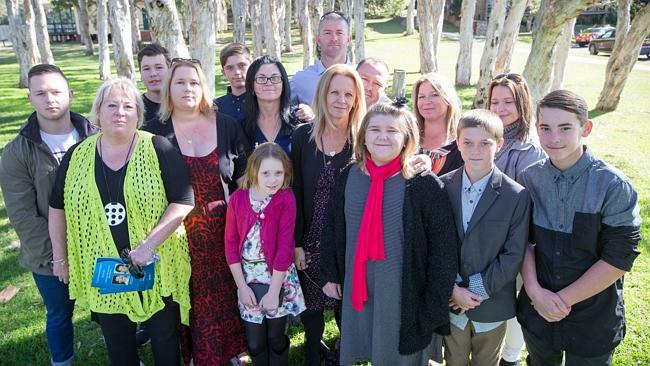 The pair, with their children Blake, 14, Joe, 12, and Charlie, 10, joined their mothers Liana and Kathy as well as family and friends today at a ceremony in the coastal town to mark the 20th anniversary of the tragedy. 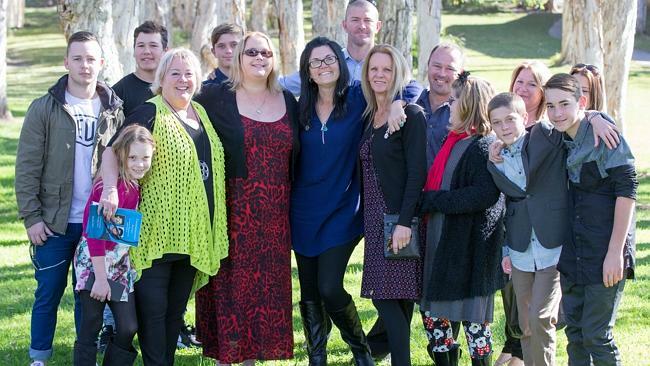 Speaking on behalf of the family, Liana (Addison) Stewart, said their families would always be connected not only because of their loss but through the marriage of their children. She said the ceremony was a special day for the family and she knew “without a doubt” their legacy would stay strong. “It’s nice they have never been forgot,” she said. 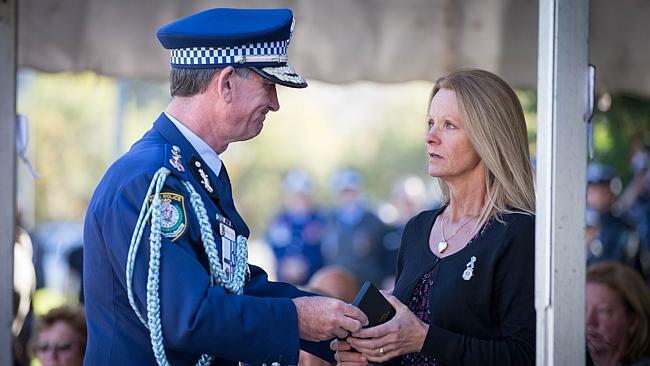 Police Commissioner Andrew Scipione presented National Police Service medals to the widows of the slain officers today in honour of the men, who gave their lives while attempting to apprehend an armed offender. 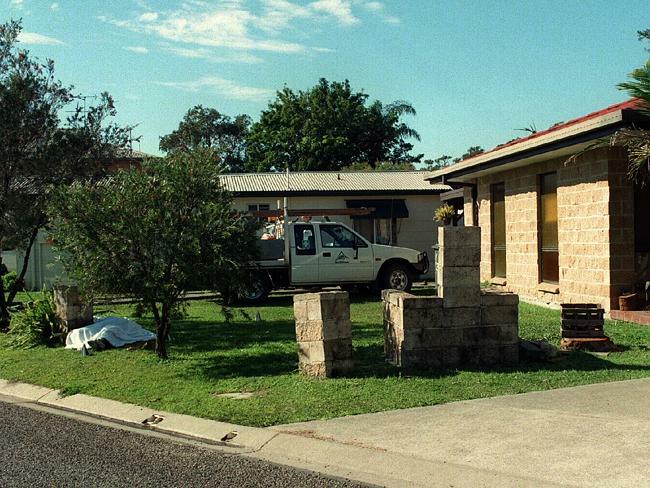 The Kempsey-based senior constables had been dispatched to Crescent Head to investigate a report of domestic violence in the early hours of July 9, 1995. As they arrived in Walker St, the policemen came under fire from drunken gunman John McGowan, dressed in camouflage gear and hiding near a carport. The officers returned fire as they sought cover behind their four wheel drive. Addison tried to call for back-up on their police radio when Spears was fatally wounded. Robert Spears was fatally wounded trying to apprehend an armed gunman. 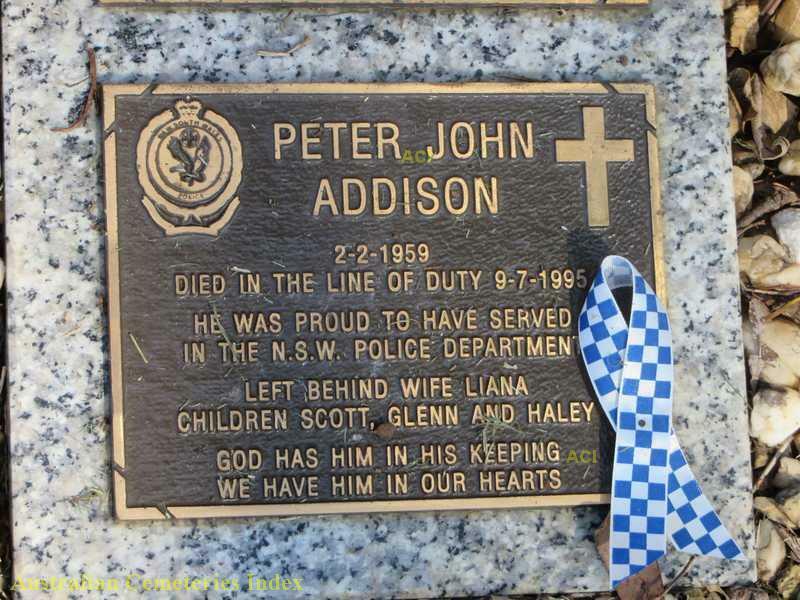 Peter Addison who was gunned down in the line of duty. In a desperate bid to seek help for his dying friend, Addison ran to a nearby house but it didn’t have a telephone. As he tried to enter another property, still returning fire, the 14-year police veteran was also shot dead by the gunman, who then turned his high-powered rifle on himself. Police Commissioner Andrew Scipione said the heroic officers had “stood their ground, defending themselves and their community from a cowardly assassin”. Their deaths led to major reforms within the force including the transition from revolvers to automatic pistols, bulletproof vests for first response officers, improved radio coverage and equipment as well as state-of-the-art tactical training for uniformed police. Walker St, the scene of the Crescent Head shootings, on July 9, 1995. 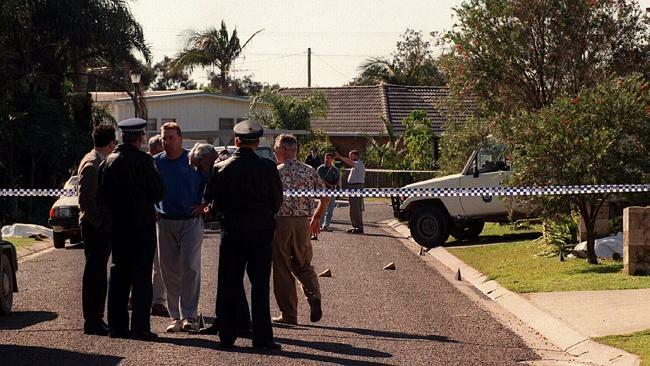 The scene in Walker Street, Crescent Head, the morning of the shootings, with the body of gunman John McGowan (right) covered by a sheet as police speak with shocked residents. IT WAS supposed to be a routine domestic violence call, but what happened next not only tore apart two families but also stunned a NSW coastal town. 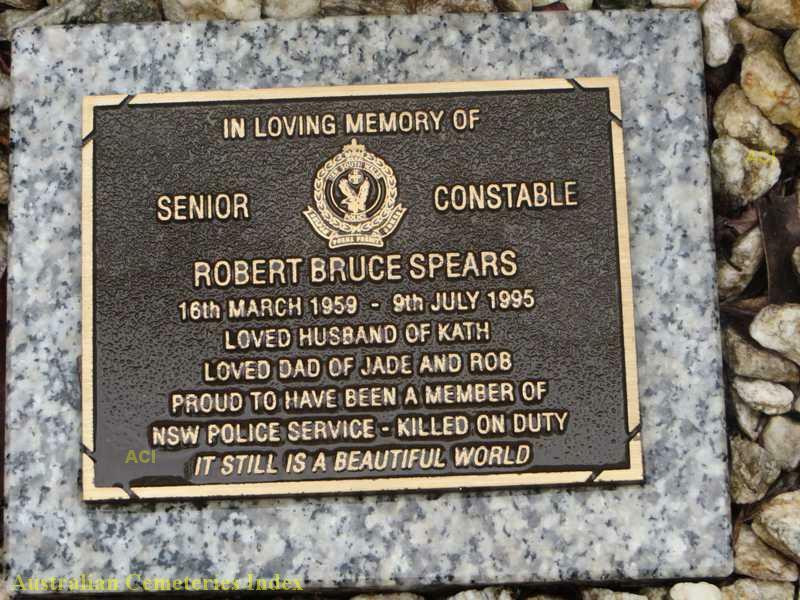 Senior Constables Robert Spears and Peter Addison made the ultimate sacrifice when they were killed in the line of duty while protecting the community of Crescent Head on the Mid North Coast from an armed gunman on July 9, 1995. 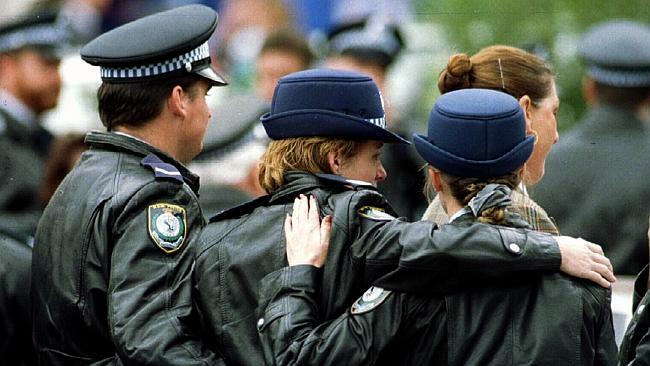 Today is the 20th anniversary of their deaths and Police Commissioner Andrew Scipione has presented National Police Service medals to the widows of the slain officers in honour of the pair’s heroism and diligence to duty. Spears and Addison, both 36, respectively the fathers of two and three children, had moved to the Mid North Coast for a better lifestyle. 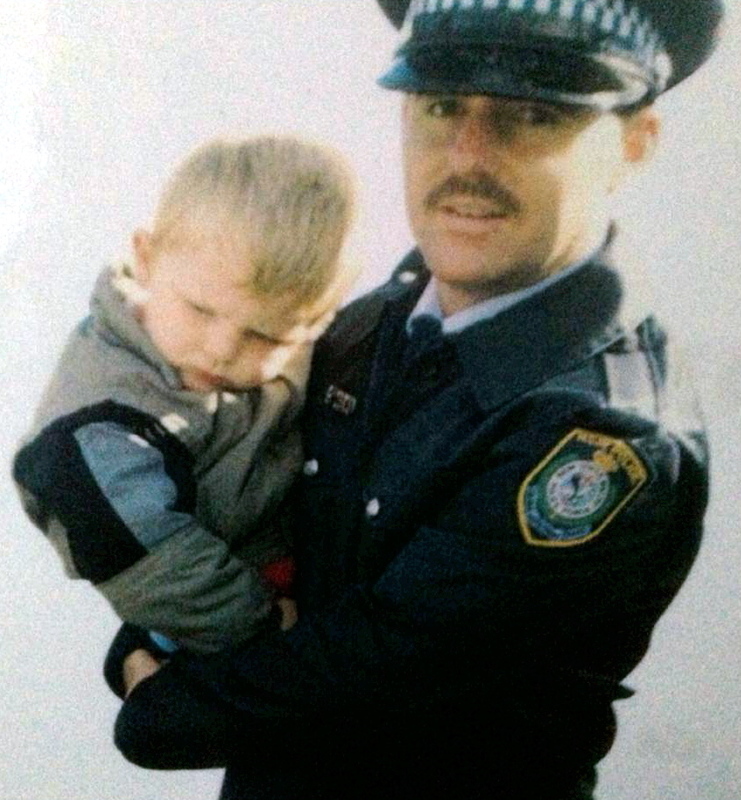 The Daily Telegraph reported at that time that on the night on July 8, 1995, the officers had kissed their families goodbye and headed out for the late shift at Kempsey Police Station. At 12.35am the officers received a distress call about a domestic violence incident at nearby Crescent Head from the former girlfriend of electrician John McGowan. The scene after two police officers responding to a domestic disturbance call were gunned down by John McGowan. 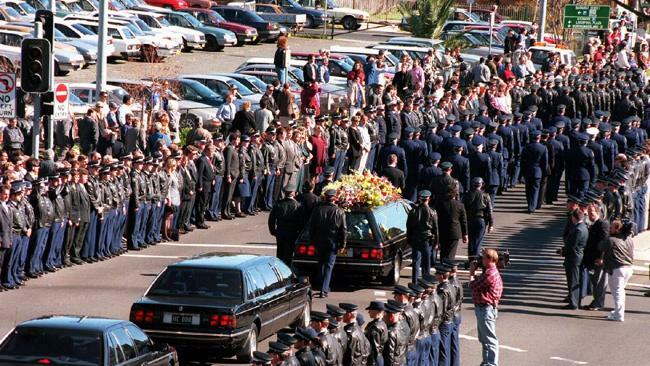 Senior police officers next to the covered body of McGowan. When they arrived into the township around 1am, The Daily Telegraph Mirror reported the police officers were confronted by a drunken McGowan dressed in camouflage gear and armed with a high-powered rifle. The officers were armed with police-issue .38 Smith and Wesson revolvers. A call for back-up was made around 1.22am. A NSW police spokesman told The Daily Telegraph yesterday that Spears was fatally wounded first, having been shot in the head. 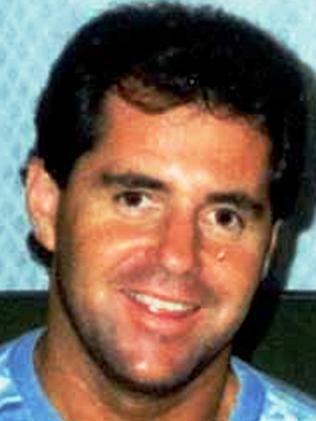 John McGowan shot and killed the two policemen before committing suicide in the street. Unable to get radio assistance, the spokesman said Addison dashed to a nearby home to use the landline but the occupants did not have one. On his way to a second house, Addison was shot dead. McGowan then turned the gun on himself. In the hours after the incident, police swarmed into the town, warning residents to stay inside their homes. Police guard lines route of Senior Constable Robert Spears‘ funeral at Liverpool. Glen Addison weeps as his brother Scott consoles him at their father’s funeral. 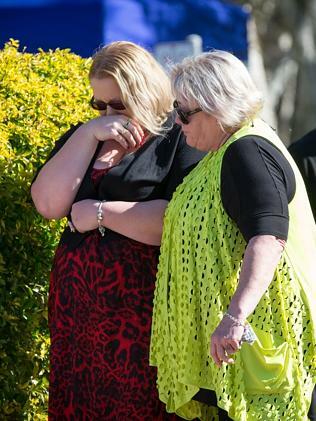 Uniformed police link arms at funeral of colleague Senior Constable Addison. 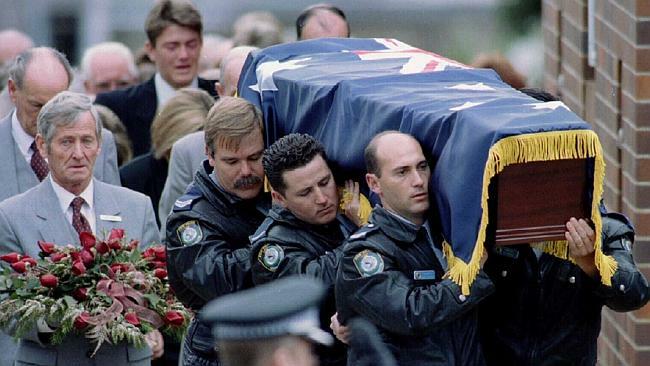 Police carry the coffin of Senior Constable Peter Addison. At that stage they did not know the gunman had killed himself. It has been reported that police found his body around 9am. 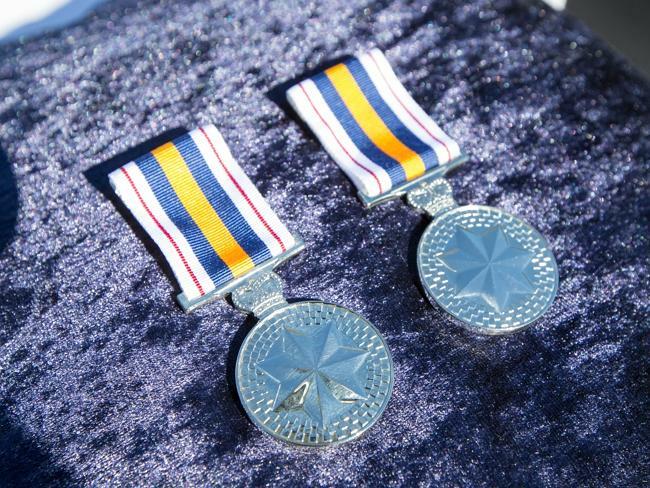 Not long after the senior constables deaths, the fallen officers were awarded the Police Force’s highest honour, the Commissioner’s Valour Award. NSW Police Commissioner Andrew Scipione says the shootings of two police officers at Crescent head is the darkest day in the NSW police history. Around 250 people gathered at Crescent head including families and friends of the dead officers where their widows were awarded with medals for officers valour. “Senior Constables, Peter Addison and Robert Spears, walked into an ambush,” he said. “Human instinct would demand you remove yourself from harm’s way in a situation like that, but not these brave officers. “They knew they had to try to stop this gunman who could have gone on to kill or injure others. “They stood their ground, defending themselves and their community from a cowardly assassin. A memorial plaque was unveiled in the town in 1996 just a few hundred metres away from the street where the officers were slain. Police Commission Andrew Scipione joined a host of other dignitaries at the Crescent Head memorial to mark the 20th anniversary of their deaths. A long list of dignitaries including former Police Commissioners, Tony Lauer and Neil Taylor, attended today’s ceremony to honour the officers for their bravery and dedication to duty. Happy Birthday Uncle Peter, loved and missed every day. Still miss your laugh, Bob. Will always miss my little brother. He was an amazing human being and a damn good cop!